Module C being lifted. This is what all of that steel is for. Bamboo Open-Web joists designed by students. These piers are what hold up the house instead of a permanent foundation. The steel angle of the home being fork-lifted. Even these were student designed. A good picture showing off the angle and moment frame. One of the moment frames going in. The crane is rigged to these black d-rings. There is great importance to the structural design of Refract House. Our goal was to design a strong, yet efficient, innovative, and sustainable house that satisfies the needs of everyone from Team California. Refract House is designed into three modules, all of which are self-sustaining structures in themselves. 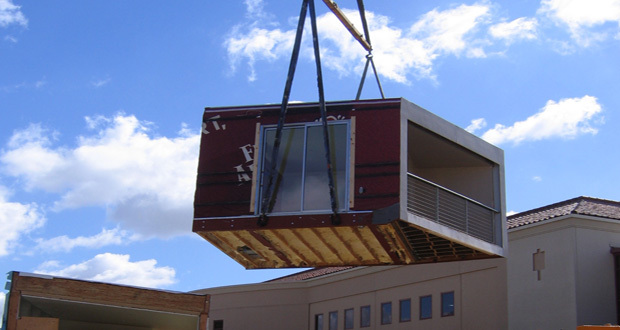 Since Refract House has to be transported across the country, the greatest concern was placed on maintaining the intent of the finished house during transportation. If each module is able to effectively function as a self-standing structure and survive the 3,000 mile journey to Washington D.C., then all three buildings will be able to effectively stand adjacent together. Some of the key features to the structural design of Refract House include custom steel angles and moment frames, perforated and segmented shear walls, newly designed open web bamboo beams, and seismic piers. A long tubelike structure with no walls in the transverse direction, a modular building requiring multiple crane lifts, and a home that will live and travel to multiple locations requiring code approval under all circumstances are just some of the challenges facing the structural design of Refract House. 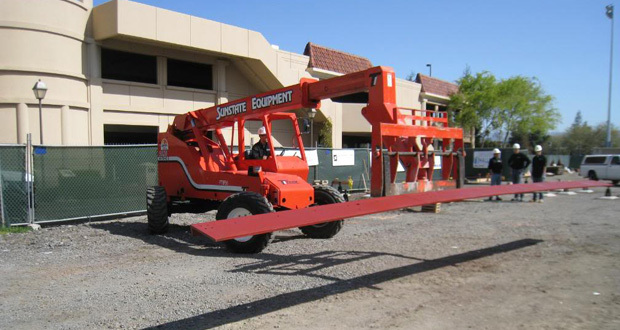 Smaller challenges, such as steel to wood and wood to bamboo connections and designing the framing for so many large openings needed to be solved. If Refract House were to be considered a living organism, then the custom steel angles would be the backbone. While in its permanent position, the steel angle takes all the gravity loads and the lateral loads and transfers them to the foundations. During moving, the angle provides a rigid support for the house and prevents it from buckling in on itself. And because the steel was essential for loading, it allowed us to accomplish the stunning architectural feature of cantilevered endcaps. Interestingly, to form this angle, a large C channel shape (C15x50) was selected, and it’s top flange was cut off, leaving a tall, strong angle for us to use. The scrap material was reused in the base of the angle to provide a level support for the moment frames to sit on. To accomplish the feeling of openness throughout the building, moment frames were needed to resist the lateral load in the transverse direction. These moment frames were designed to be as light as possible while still passing all of the governing seismic loading conditions. Special consideration was paid in making sure that it’s cross sections complimented the wood framing around it. The walls had thin 2x6 framing so the columns of the moment frames were as thin as possible, while deeper floor and roof joists allowed us to use deeper but lighter cross sections in the floor and ceiling. Furthermore, holes were strategically cut in the center of the webs of the moment frames to allow wires and pipes to easily pass through them later in construction. 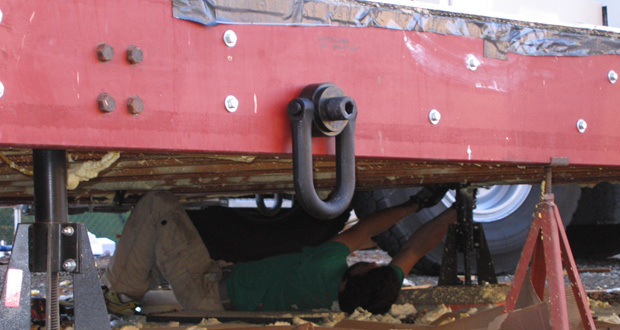 Traditional shear walls were designed in the longitudinal direction to safely meet all loading constraints. Where possible, a larger stud spacing (24” on center) and nail spacing was used, which means we used less material wherever possible. Always keeping innovation and sustainability in mind, new open-web bamboo beams have been designed to be used as the roof joists for the house. 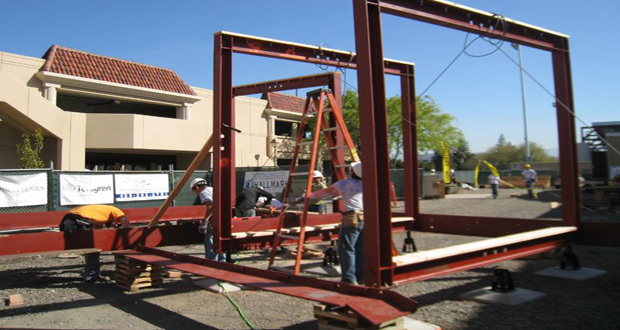 These beams are similar to the beams used by Santa Clara University in the 2007 Solar Decathlon, however they have been altered to improve the ease of construction. The beams have an open-web so ducting, electrical wiring, and plumbing can be easily run through, while still providing structural support for the roof. While the competition does take place in Washington D.C., where there is little to no seismic activity, we still designed this house under the governing load case, which was at Santa Clara, California, where the seismic activity is high. Therefore, we used a seismically rated pier which gives our house a firm, safe, and modular foundation.